Presidential candidate Ahmed Shafiq said Friday that he does not have any problem having a prime minister from the Freedom and Justice Party, the majority party in parliament, if he is elected president, so long as nothing in the upcoming constitution says otherwise. In a statement made on Al-Hayat TV channel, Shafiq thanked the armed forces for its role, saying that the relation between the state and the army will be determined in the upcoming constitution. Answering a question regarding the possibility of drawing on the presidential candidates who failed in the first round, Shafiq said that the presidential team that would aide him as president would be representative of all currents in Egyptian society. "There will be representation for each sect and power in society, without polarisation; there will be representatives for Christians, women and Islamists," Shafiq said, adding that any decision taken by the presidency would come after talks with representatives of different powers. 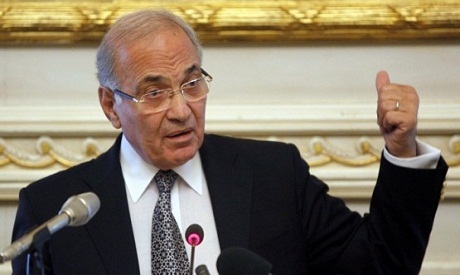 Shafiq denounced those who say his election would reproduce the Mubarak regimme, describing these opinions as hostile. Shafiq insisted that his presidential platform would achieve the goals of the revolution: "Bread, freedom and social justice." According to the preliminary results of the first stage of Egypt's presidential elections, Ahmed Shafiq and Freedom and Justice Party head Mohamed Morsi will compete over the presidential position in runoffs to be held 16-17 June.